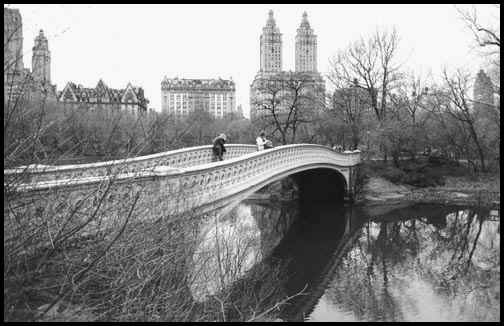 Bow Bridge is among the "Ten Best Places" in the world for lovers to visit. The other 9 best places just happen to also be in Central Park. I won't tell you where they are, because half the fun is finding them yourself... with your lover of course. 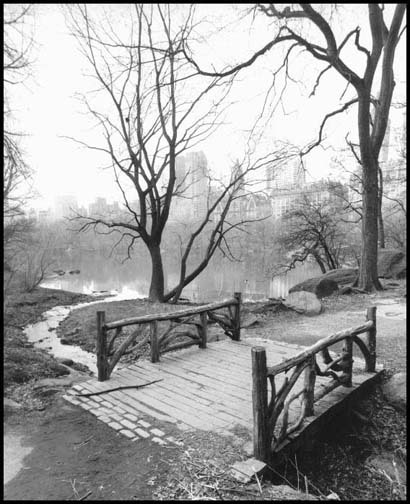 Of all the iron bridges in Central Park, this is the most graceful. The picture was taken a few minutes after morning light appeared. An hour or so later, the park activities had started to turn the snow into messy slush. Something different! 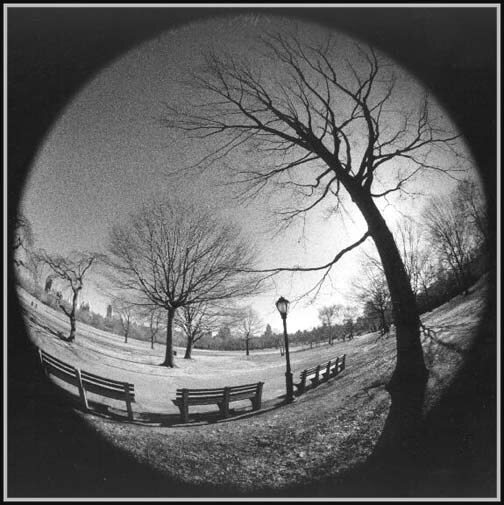 This is Central Park's Great Lawn taken with a funny lens. In my site's color section you will find another shot with a giant rabbit on the Great Lawn. Hundreds of humans are trying to restrain this rabbit. It has to be seen to be believed. 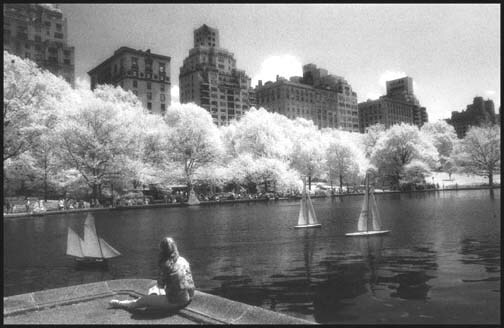 This scene was shot at Central Park's Conservatory Water (Sailboat Pond). 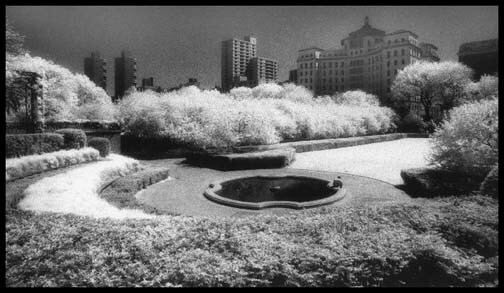 The unusual tones are due to the use of infrared film, which can respond to colors that are not not visible to the eye. 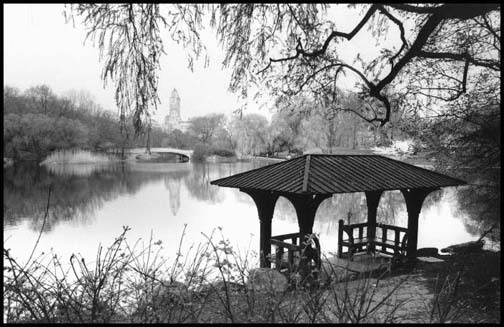 A view from the west side of the Central Park Lake. 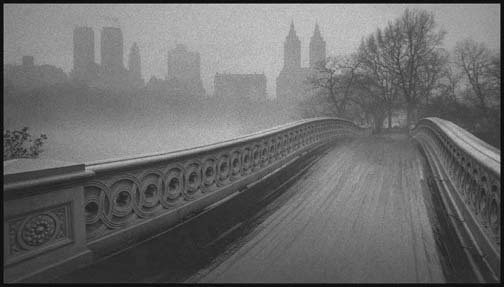 Bow Bridge is in the background. This bridge was shot immediate after a wet snow fall... which has a tendency to stick to branches and everything else including cameras. No, this isn't Italy. 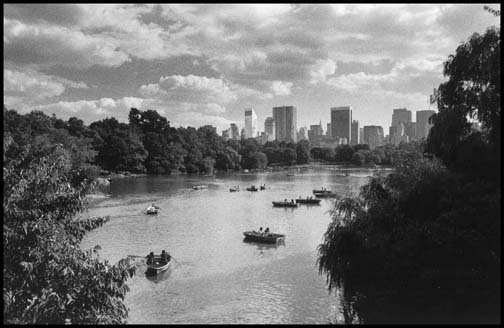 This picture is the Central Park lake on a Sunday afternoon. To give the image more visual depth, I shot though the foliage. 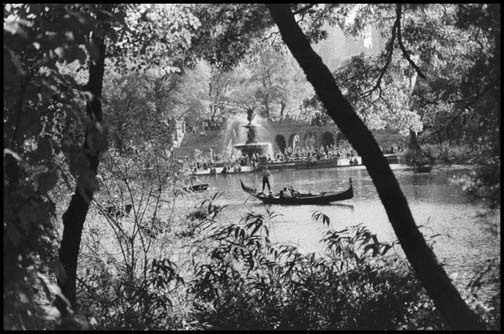 Bethesda Fountain and Bethesda Terrace are in the background. A nearly frozen lake with a fresh layer of snow on it. To the left you have ducks enjoying the cold water. The skyline fades into the distance. A lucky grab shot... I didn't even have time to focus properly. 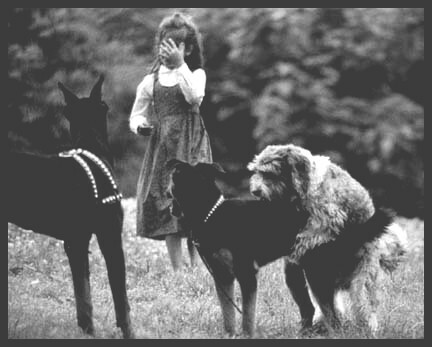 The moment that I snapped the picture, the viewfinder on my camera blacked out (Single Lens Reflex) and for this reason, I did not know that the child had covered her face. I became aware of this later that day while I was processing. Due to the fact that the child is unrecognizable, I own the total commercial rights to this image. A tranquil summer morning. The crowds of park enthusiasts have yet to arrive. It's hard to believe that this is the Middle of Manhattan. 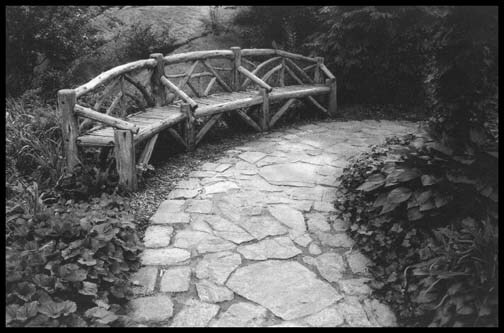 This Rustic Bridge crosses the Gill in a wooded area of Central park called the Ramble. 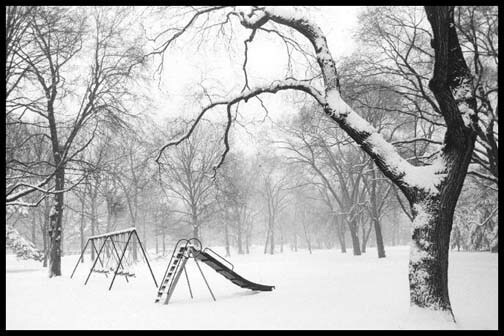 It's very early now, but soon the children will be all over the playground equipment... and I will be home doing darkroom work. Conservatory Garden is actually three unique gardens... each one more wonderful than the next. 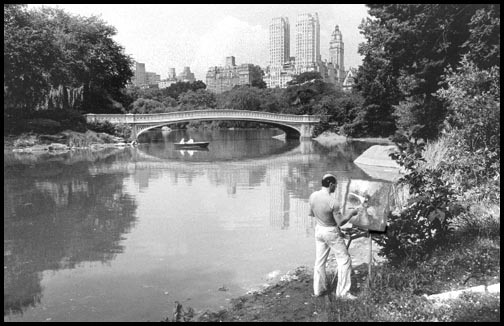 This great view from Central Park's West Drive was intended by design. What wasn't intended were the buildings sprouting up as mushrooms. A wonderful juxtaposition of nature and structural architecture embraces the eyes. This is in Central Park's Shakespeare Garden. 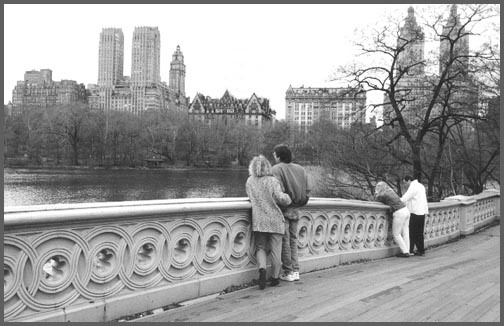 The walkway leads to Vista Rock which has Belvedere Castle built on it. From the castle, you can look down on the Delacorte Theater stage and see rehearsals in progress.This park is so darn great! 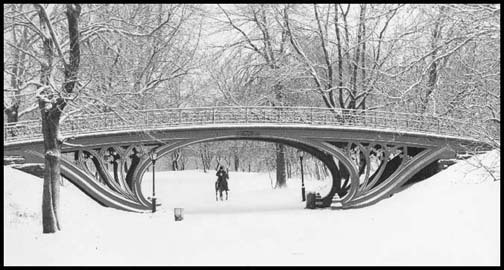 Here is this unique bridge in the late winter. People just enjoy relaxing on this bridge. Most bridges are intended for getting from one side to the other and you don't spend any more time on them then is necessary. Bow Bridge is different in this respect to the fact that people will stay on the bridge for hours at a time. A early evening view from the Gapstow Bridge. You can see where Central Park meets midtown Manhattan. 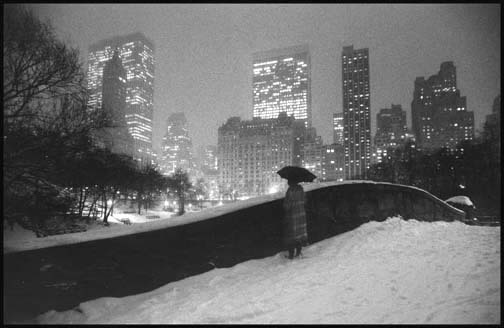 In the center background is the Plaza Hotel. 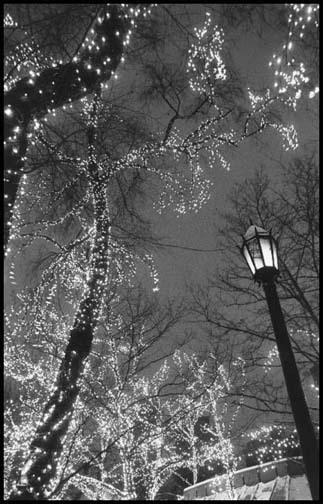 This famous restaurant covers all it's trees with lights all year around. When ever you're in N.Y.C. check it out. It gets better with every year. The Pool is an idyllic pond located in the north/west part of the park. My camera was pointing east the morning that I took this picture. 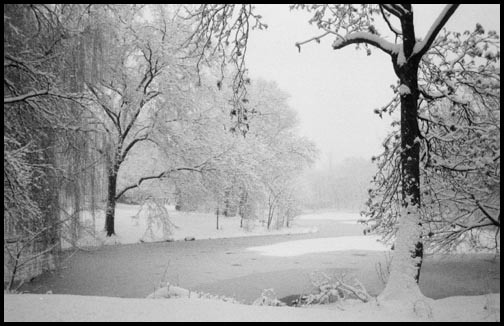 I hope to find, dig out and post some spring time shots taken of The Pool in color many years ago. 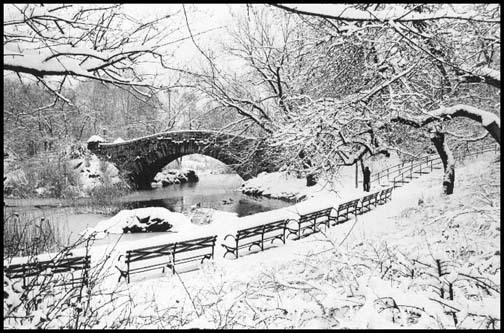 This is the most beautiful bridge in the park. While work was under way on the construction of this bridge (1859-60), the company providing the ironwork had won the contract to do the same for the dome of the Capitol Building in Washington DC. You can see Manhattan's upper westside in the background.